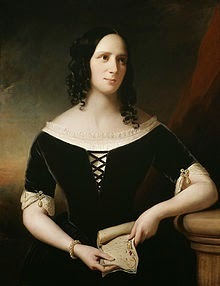 Agnes Strickland was the second daughter of the nine children born to Thomas Strickland and his second wife, Elizabeth Homer. Five of these children would, like Agnes, become writers. Because his health was not good and his financial situation was precarious at best, Thomas Strickland educated his daughters so that they could support themselves--and so his daughters began to write. Although she continued to write and publish poetry, including Worcester Field, or the Cavalier (published by subscription in 1827) and The Seven Ages of Woman and Other Poems (1827), Agnes Strickland published translations of Petrarch's sonnets in the New Monthly Magazine and began publishing children's books, beginning with The Moss-House: In Which Many of the Works of Nature Are Rendered a Source of Amusement to Children, in 1822 and The Tell-Tell in 1823. She also began to write history, at first, with her sister, Elizabeth, a series of historical books for children, including Historical Tales of Illustrious British Children, in 1833 and Tales and Stories from History, in 1836. But the work for which Agnes Strickland is most well know is her series of histories of women, beginning with the twelve volumes (yes, twelve!) of the Lives of the Queens of England, published between 1840 and 1848. For this work she did not rely on secondary sources but undertook original, archival research using unpublished material, especially the official State Papers. At first refused permission to conduct her research, she was eventually allowed access to the documents. Although Agnes Strickland's is the only name on the title page, she continued to write with her sister Elizabeth, who, for reasons of privacy, preferred to remain uncredited. While engaged in this massive effort, Agnes Strickland also published three volumes of The Letters of Mary Queen of Scots (1842-1843). After her work with the queens of England was complete, she continued her work with Lives of the Queens of Scotland and English Princesses Connected with the Regal Succession of Great Britain, eight volumes published between 1851 and 1859. Strickland did write histories of men, including a series of lives of the "bachelor kings" of England and of bishops "committed to the Tower in 1688," but finished up her history-writing career with Lives of the Tudor Princesses, Including Lady Jane Gray and Her Sisters (1868) and Lives of the Last Four Princesses of the Royal House of Stuart (1872), which proved to be her last work. She died on 30 April 1875. The above is not a full listing of her work--for a more complete bibliography, you might check the online entry in the Oxford Dictionary of National Biography (this is not the current edition of the ODNB, but you don't need a subscription to access this older entry). You can access Strickland works quite easily through Project Gutenberg or the Internet Archive. There are also reprint copies, at various prices (mostly expensive), available at Amazon.